If your home is like ours, somebody is always asking Alexa to do something. We love our Alexa because it’s handy and plays music when we just want to listen or have people over. In order to have the best experience with your device, you need to have the right speakers for the job. But it’s not always obvious which speakers can be paired with Alexa. We will discuss our top five picks – each one completely compatible with Alexa. 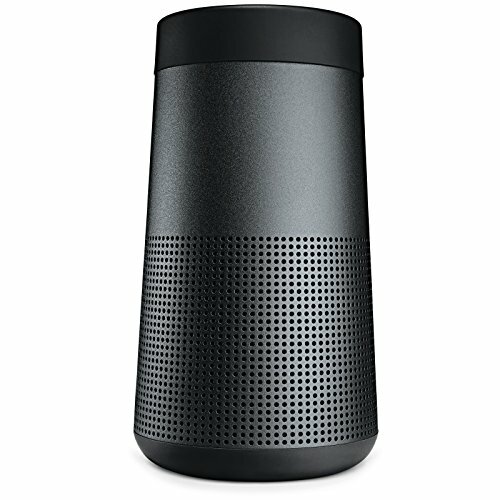 Which Speakers Can Connect With Alexa? 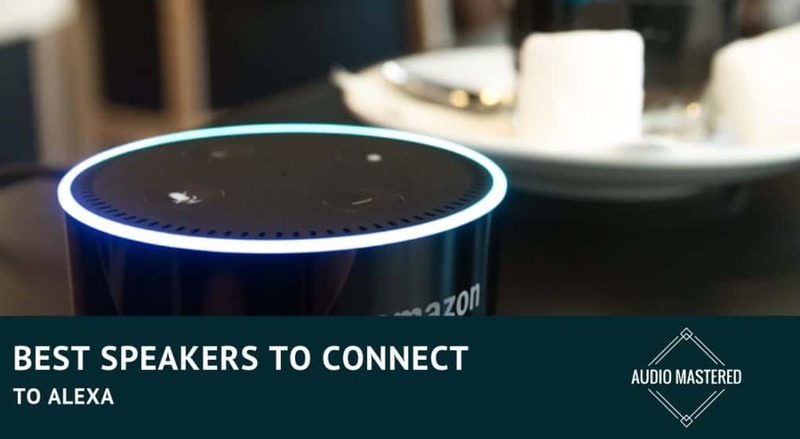 First off, it’s worth answer this common question: which speakers can connect with Alexa? If you want to control Alexa through the speakers then that’s a different story. There are only a handful of speakers that come with Alexa built-in. You’ll find the best ones on the list below! Here’s a few other things to keep in mind as you shop for speakers. Form and Size: Would you like your speakers to sit on top of your desk, or would you like a speaker system that features a sound bar as its way to deliver the sounds? Portability: Would you like a speaker that you can take with you when it’s time to head outside? Bear in mind you will need to make sure you’ve got batteries to keep it charged, depending on which one you get. Function: Do you want just a speaker, or do you want one that has an extra feature, like an alarm clock? Appearance: Does how the speaker look matter to you? Is it important the speaker fit in with the rest of your office/home decor? Without any further delay, here are the top five choices complete with pros and cons so you can make an easy decision. 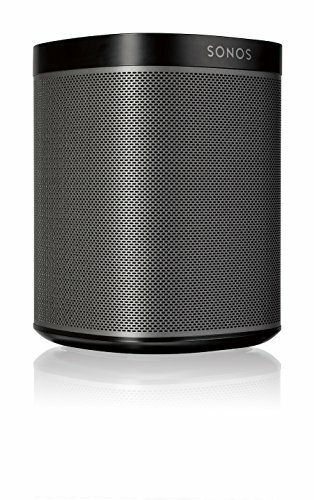 Best For: People who just want a speaker that plays sound clearly, at a decent volume, and a speaker that just works. I’m sure you’ve seen these speakers around. They are incredibly popular right now. The sound quality is amazing, and it can easily fill most household rooms. The functionality is unparalleled and it seamlessly syncs with all of your other Alexa controlled tech. It can even pair with other brands of smart gear. So, if you’ve got a Nest thermostat, for example, this is a great tool to control it. You can connect with other Sonos speakers to get the whole house into the music, the news, or whatever it is you’re listening to. Putting two of these cool speakers together brings you instant stereo sound, and we love the sleek black look. You can get it in white too, if that will look better in your home. Amazon Alexa is actually built right in. One single voice command can start all your Sonos speakers up and get them to play your music. Play music from Spotify, Pandora, iHeartRadio, and Sirius XM, plus many more streaming services. Best For: those looking for the highest quality speaker for the price. This is the highest rated Bluetooth speaker on the market today. If you’re looking for a speaker than can be controlled from Alexa then this is your second best option after the Sonos. It’s expensive, but the design is excellent and it sounds great for small speakers. Not only does this speaker play louder, the bass response is best-in-class for a speaker of this size. This speaker is so popular TechRadar has rated it as one of the best Bluetooth speakers on the market. 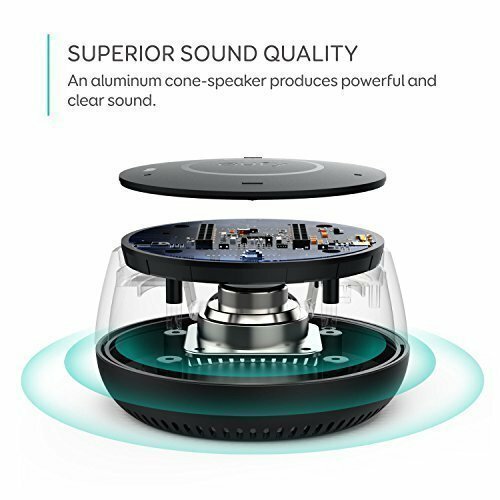 If you want a speaker that produces the best quality sound that can easily be connected to Alexa then this is your option. This is the speaker for all you active people and families out there. This speaker can take a beating. It’s probably most famous for being strapped onto bikes. It’s waterproof, which means you won’t have to worry about the kids leaving it outside during a rainstorm. The cool cylinder style is pretty neat in its design, and there are plenty of cool colors to choose from. It’s pretty good sized too, and easy to carry around. The wi-fi enabled control is convenient, and you can use Alexa to stream all your favorite tracks or podcasts. Bear in mind this one is not Airplay compatible. You can also buy an optional Power Base, so you never have to worry about batteries. The sound is 360 degrees – however, I won’t go so far as to compare it to a Bose speaker, but this really does a great job providing sound for the price. If you’re interested in other outdoor speakers you can check out my reviews of the best speakers for the beach here. Best For: Those who want something that can connect to their T.V. creating a surround sound experience without the need for additional speakers. For small to average sized rooms. 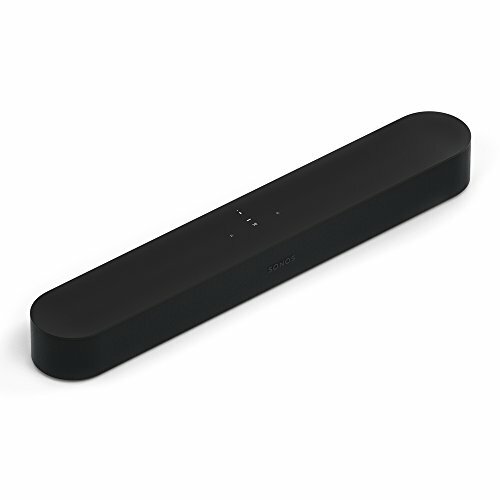 This compact soundbar connects right to the TV, and it has Alexa support plus Airplay support as well. It connects well with other Sonos speakers, so if you’ve got one or more speakers of that brand get them connected for a sound experience that’s going to make your party jump! If you have a Sonos Sub, that will really add a nice depth to the sound. This is great if you have a regular-size living room and you want to fill it with sound. Plus, it works with many TVs, so no matter if you’re rocking a small screen or a big screen you get to enjoy quality sound with ease. The Beam plays movies and TV shows with just a quick command from your voice. This one was a pleasure whether it was time to relax or time to party. Sound fills entire room as it radiates from the bar. Fits just about anywhere and looks great. Cannot be combined with any Echo devices that may be in other rooms. Best for: Those desiring a fun alarm clock that can be controlled from Alexa. This isn’t your grandma’s alarm clock with the bells and the windup on the back! This is an alarm clock that has Alexa built right into it. The device is directly inside of the clock, and it can do everything the Amazon Echo can. However, the design and build of this clock is rather clunky. There is not even a dock for your phone, which would have been a great place to charge your device after a long day. The time is displayed huge digits, but other info like weather and the Wi-Fi status is tiny and hard to read. 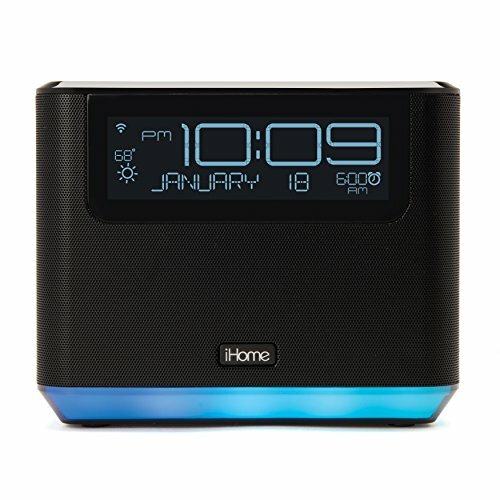 The clock has 14 total buttons on the top, plus two smart buttons you can pair with your iHome smart plugs or start up your playlists. I like that you can sync it right up with Spotify, and then have one of the songs on your playlist stand in as your alarm song. Sure beats the classic buzz sound or the default tone on our smartphones. All in all, we like this clock and its ambient accent lighting features, as well as its functionality. I have more reviews on the best sounding clock radios here if you’re interested. Works with your iHome – smart switches can turn off lights, start the fan, etc.-all from your bed. Chunky design-this is not sleek or “cool” in its appearance. Alarm will not go off unless Wi-Fi is connected. Best For: Kids, college students, people who are on a budget but still demand quality. If you or your kids want an Echo Dot but don’t feel like spending the money – or maybe you already have one and want an alternative-consider this Eufy Genie. It’s a nice low-price alternative for kids, too-you can put one in their playroom or even give one to your college student for their dorm. It measures just 3.5 inches across and about 2 inches high and is encased in a sleek plastic housing that sits anywhere and is non-intrusive. You just connect to the Genie’s WIFI network and then go through the Eufy home app to connect it to your home network. The light ring will glow based on how high the volume is. The audio here is pretty good-we tried out “Sweet Caroline” by Neil Diamond and found the bass to be pretty good for such a small, 2-watt speaker. The Genie can also do all the things Echo Dot can do-so go ahead and use to call for pizza, then get back to the party. The best bet is to choose whichever speaker suits your family and needs best. If you need to stick to a budget, go with the Genie. If you want the best, go for the Sonos One or the Bose speaker. Whichever one you choose, have fun and don’t bother your neighbors too much!